My drum and percussion learning system will help you progress quickly if you are starting from the beginning or adding to your knowledge and abilities. Visit my studio for a trial lesson. Let’s talk about developing you or your child’s passion to play drums and percussion. Let me help you make your dream a reality. Excel with my revolutionary learning system designed to help my students succeed in all aspects of their percussion experience. Classes based on each students needs including Individual instruction, small ensembles, workshops, drum line instruction, performance opportunities, and personalized referrals & recommendations, to name a few. 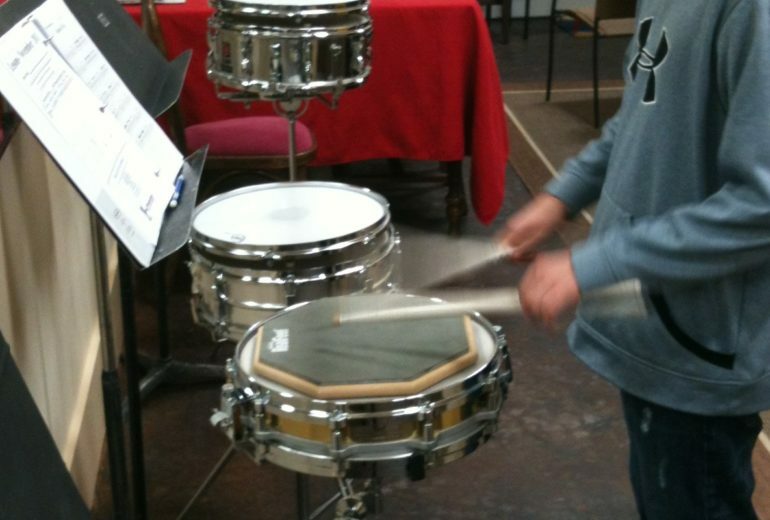 Snare Drum Lessons are the foundation for all drummers and percussionists. All students require well developed skills including drum rudiments, counting patterns, coordination skill, scales and ear training and music sight reading. Learning to play drums and percussion starts with solid basics. 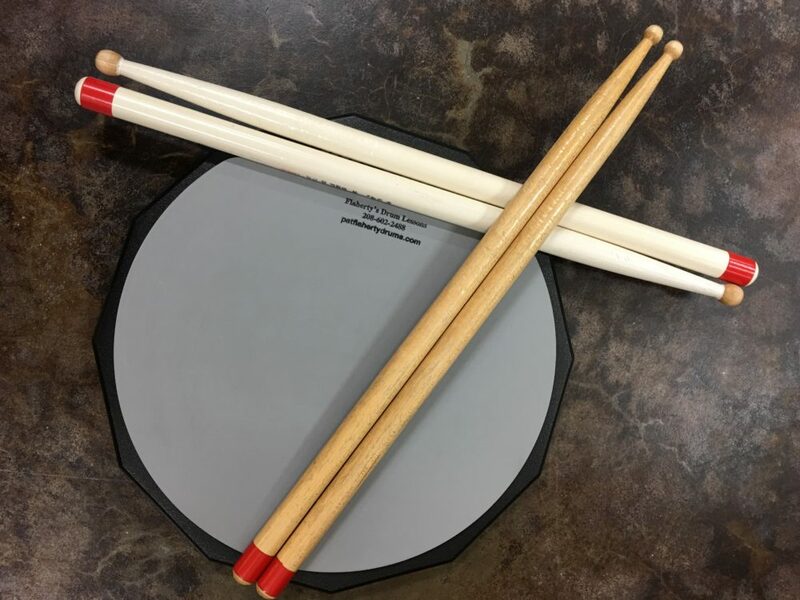 Rudiments, my counting pattern system, and developing better coordination all lead to your success on all the drums, drum set and any percussion instrument. Playing Timpani or “kettle drums” is one of the most desired positions in a professional orchestra. 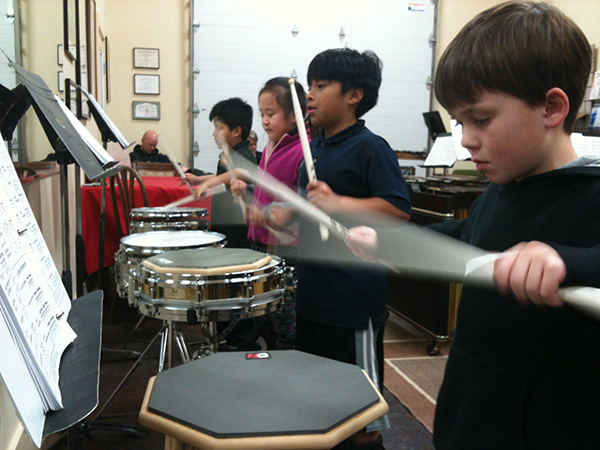 School programs tend to wait to teach timpani and provide little or no instruction to beginning timpanists. Learn to develop ear training skills, timpani tuning, tone production dampening techniques, solos and repertoire, and more. Joining a musical group is one of the best ways to learn to make music. Most public school programs start with beginning band in 5th or 6th grade. To improve drum and percussion playing skills it is highly recommended to take drum and percussion lessons. Here you will learn the snare drum, mallet percussion, drum set and timpani skills to fully enjoy your school band experience. When players progress to high school band the music is instantly much harder. Most drummers are put on an easy part until they “catch up” with the group. Most School Band Programs pass music and after a few months there is a performance. A missing element in most cases is teaching basic reading, coordination, rudiments, sight reading technique and refined ensemble skills. After high school they lack the skill and technique to survive in college groups. It is an activity where everyone remembers the fun from the fellowship and combined with drum and percussion lessons will give a player lifetime skills to enjoy. Another type of music group is a Drum Corps. Drum Corps are made from highly skilled players who know their basics. They are private non-profit organizations. They only start with qualified players that are only admitted by passing an audition and the staff places members where they augment the ensemble. Members show up prepared and in most of these groups slacking off ends with loss of membership. 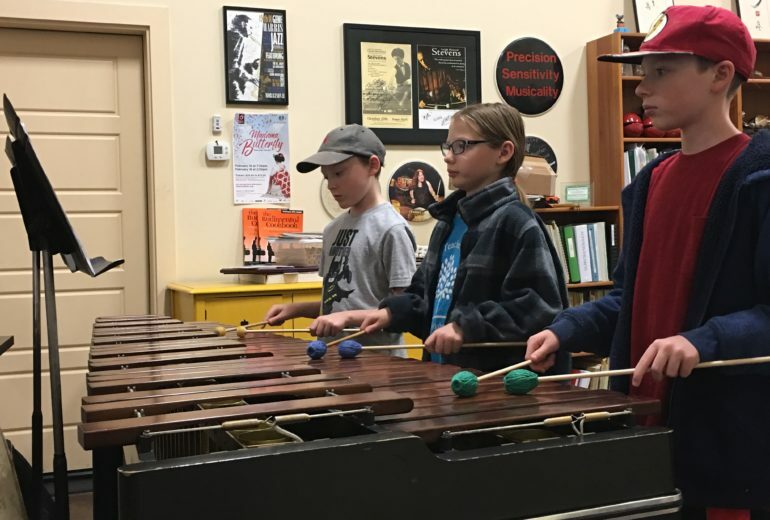 Learn the proper techniques for playing Bells, Xylophone, Marimba, Vibraphone and other mallet percussion instruments. Hand positions, 4 mallet grips, quality tone production, posture, sight reading techniques are all covered. Most school programs start on the Bells and later add Snare Drum. When you are prepared on these instruments school band is a lot more fun. Stay ahead of the class with great mallet lessons. Playing in an ensemble is one of the most challenging and difficult techniques to learn. Learn the effective ways to develop your skills when learning by playing in a small ensemble with players at the same ability level. With proper guidance you will learn the difference between “playing together” and “playing clean.” Matching your sound with other players defines your membership in the best performing ensembles. Learning to “Play in the Pocket or Groove” with others is also one of the most difficult skills to earn. Students graduate to Small Ensembles when ready as recommended by the teacher. I focus on building a studio where students can have the best drum and percussion instruction available for a reasonable cost with access to resources and opportunities from my network throughout the world. Every day is focused on improving something for each student or director. Whether it’s a new technique, performing opportunity, equipment knowledge or scholarship opportunity I continue to grow and improve my studio every day for all my current and past students and directors. "You know, I was a high school senior at Boise High and graduated in 2015, and having been in music from when I was in sixth grade, I had believed that I knew something or two about Percussion. And yet within the weeks of working with Mr. Flaherty, I now realize that many of the rhythms that I knew were merely cheap tricks, and that in order to be a truly good Percussionist, you must have your basics down. Basics, in fact, are probably the most important, yet least stressed area of Percussion, and I have Pat to thank for helping me to fix what issues I had. My playing has improved by a considerable margin and I have him to thank for it." "When I came here I knew nothing about drums and after two months I could understand music easily. These lessons make me focus on school band more. When I hear music on the radio I can count and keep the beat to it. The studio has every percussion instrument, not just drums. I enjoy playing music so I can play it to impress friends or just to have fun. I focus more on music and on getting it right than not playing it wrong and sounding like trash. I think lessons will get me pretty far in life. IT IS FUN!" "I started years ago with Pat knowing keyboard but was just starting to delve into the world of percussion. I was unsure if I would like percussion, but have grown to love it. Pat is definitely the best teacher/instructor I've ever met, and needless to say, my Favorite. If you've ever considered starting music (in percussion), this is by Far the Best way to start and get into it." "Both my daughters are learning from Pat. He's a great teacher and both my kids like him. I can see their understanding of music performance has improved a lot during the past year. Best of all, Pat teaches them some of the life lessons from time to time. You know, kids sometimes do not listen to their parents. But they listen to their teachers, and it works pretty well!" "I can never remember not wanting to be a drummer and percussionist. I enjoy listening and playing music. Heck, I play at least three instruments. At first, drumming was just hitting a certain drum to me or just bang on something in a certain way or hit something in order. After finding Pat, however, I learned so much more. The drums here are plentiful so you'll never run out of fun. And, there are certain drumsticks Pat will allow you to use. With my new knowledge of drums, music has opened up to me a bit more. I can enjoy my school bands better, hear the art of music, and even rock out with my own solo. However, I won't plan on making it a career. For me, right now, it's just a really fun hobby for me to do in my down time. Pat has allowed this to happen and I'm thankful for that." Before taking lessons with Pat, I wasn't comfortable playing mallet percussion at all. Pat was able to guide me in several ways to develop and improve technique, sight reading, and musicianship overall. A few years later I worked up a 4-mallet keyboard solo and won second place in the Idaho All State Solo Festival. Shortly after that Pat helped me audition get into the 2015 All Northwest Concert Band. Pat definitely has the tools and experience that he can provide to any student to help them become the best musician if they are dedicated. [Peter is now a student studying Percussion on scholarship at the University of Idaho]"
"We are very pleased with our experience in Pat's Studio. Our son has grown so much with regards to his percussion abilities. His improvement and skills earned him the title of "Drum Captain" in his high school marching band. The price is very reasonable. The knowledge is even better. Pat is very professional and approachable and friendly. Thank you for helping our experience with lessons be a good one. We hope to see our son go way past high school band." "I started the same as everyone else. I thought all I had to do was beat a drum, but I was mistaken. I walked in not even knowing how to hold a drumstick. I've been here for a couple of years now and with guidance from Pat I've improved a lot. I've become the Jazz drummer for my high school's jazz choir group and I even do a few miscellaneous musical performances for those who ask; and it all started right here in this studio! Taking lessons here was a very positive turning point in my life and I'd recommend learning here. It's so much fun and completely worth it." "Drum lessons have always been very professional. I've improved greatly with Pat's help. He has a cheerful atmosphere that helps with learning. School band has become much easier." We have had a great experience taking drum lessons here at Pat's Studio. My son came with no experience and not even sure he was going to enjoy playing. He has come to really love it and is now able to participate in school band - which he really enjoys. He has learned, and is still learning, how to use self-discipline and improve his organizational skills to make his practice time efficient and effective. Pat takes so much time and makes every effort to help my son understand the lessons. He is very good at finding creative and useful ways to relate real life experiences to the lessons so they stick with the kids. Pat is always willing to help with any questions and goes out of his way to assist with problems my son may be having with his school band music as well. He has been a life saver and has helped my son discover an activity he will enjoy for life." "I have improved very well taking drum lessons with Pat. Taking lessons here has helped me decide what I want to do in life and has helped me decide where to go for college. I really appreciate the cleanliness and organization of the studio. I love making music at this studio and it has made me want to write and compose my own music multiple times. It has helped me tremendously in school music especially marching band. Taking lessons with Mr. Flaherty doesn't just teach you drums but also helps with life decisions and inspiration." "Our son has been taking drum lessons from Pat for one and a half years. Pat's method has made it easy for our son to learn counting, coordination, and reading music. It has encouraged him to want to try playing other instruments. We have had a very positive learning experience from Pat." "It is fun to see Eli grow as he has been taking drum lessons from Pat. I am amazed at what it takes to be a drummer! Even I have learned as I sit and wait during lessons! Thanks!" "Drum lessons with Pat allowed Lucas to come up to speed in junior high band! My experience here at Pat's studio has been very positive. Pat has impacted Lucas' percussion knowledge significantly and enhanced his overall music ability. The level of professionalism I view at Pat's studio is the highest level and it exceeded my expectations. Some of the specific things I like about the studio are the open and comfortable space. Patrick's legacy is all over the studio. Lucas is now practicing drums more than guitar (his original instrument). Lucas' school band experience is much better. He has achieved competence and enjoyed the experience. I believe these lessons will help Lucas' musical career. They have significantly enhanced his overall musical knowledge. I particularly appreciate Pat sharing his experiences from his musical career." "You will be better at school band and know almost maybe everything. You will become a great drummer or percussionist and practice everyday and maybe become famous. IT IS GREAT!" "Drum lessons here with Pat are fun and very technical. My son started at the Boise Rock School but we wanted someone to give him the fundamentals of drumming and Pat is just the person to do that. Pat is very patient and can relate to all age groups and abilities. He gives lessons that are challenging enough to keep the students' interest without overwhelming them. We are glad we discovered Pat's drum lessons." "The students in my son's class act as a team. They learn from each other, helping those who struggle, encourage each other, sometimes even give each other a hard time for their mistakes. Pat has a way of knowing which kids will compliment each other and fostering this fun creates a comfortable and positive learning environment. My son has thrived musically and socially in the year plus while he has studied under Pat." 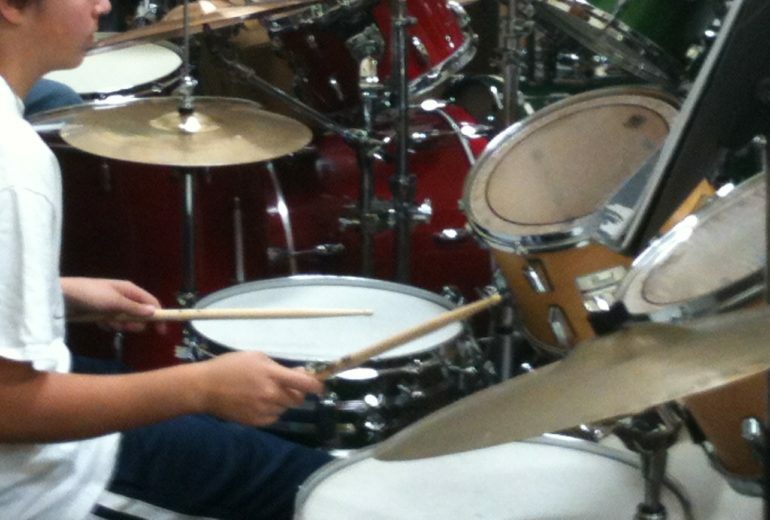 "Since beginning drum lessons in September I have seen a marked improvement in Caleb's confidence in his playing. The studio I well equipped with various instruments to assist teaching the students. I like that Pat discusses with the students a philosophy of life-long-learning. Learning an instrument is a continual process. Thank You!" "I like these drum lessons with Pat for a lot of reasons. It has helped me a ton with percussion in a short amount of time. It has made me understand music a lot better also. Drum lessons have made me like playing and making music a ton more. It has also helped me in school for band. I can play all of the music a ton better for concerts." "I have been so impressed with Pat and his technique in teaching and interacting with my son. He is a professional and it shows; not in just playing percussion but in teaching. My son looks forward to his lessons. Pat has ignited a passion in my son to practice and improve in percussion. I would highly recommend lessons with Pat. His studio is amazing and well equipped with everything. It's a fun place to be." "Our seven-year-old son started taking drum lessons with Pat about nine months ago. I was immediately impressed with Pat's patience and professionalism. Out son has ADHD and his attention sometimes wanders, but that has never fazed Pat. He just takes it in stride. I've seen him work with some other kids and not only are the lessons tailored to a student's level but they are specific to that student and his or her learning style. After about six months of watching the lessons and helping our son practice at home, I decided to take the plunge and signed up for my own drum lessons. At age forty I had never played an instrument and couldn't read music, but I've learned a lot already and I'm really having fun. With Pat's guidance (and consistent practice) anybody can do this." "The experience at Pat Flaherty Drums is amazing. He'll teach you at a good pace and show you the steps for everything you need to become a successful drummer. From mallets to drums, Pat Flaherty Drums is the company I'd recommend." "My child's drumming has improved greatly since he started lessons with Pat. He had to try out for a solo in his band concert and he go it. I believe the extra lessons he had with Pat helped him secure that solo. I recommend Pat to any parent looking for lessons for their child." "Kyle has loved coming to learn from Pat each week. Pat is so patient and encouraging. Pat really takes the time to talk to Kyle and help him fully understand what he's working on. It has really helped. Kyle's skills have greatly improved. I really appreciate how Pat will work with Kyle to improve the music he's playing at school. And Kyle's band teacher has noticed the improvement also. Kyle played a different musical instrument last year, but he was never motivated to practice. With Pat's instruction and guidance Kyle has loved practicing and improving." "Our son Joshua has found Pat's class to be a very positive experience. Pat has an ability to help kids improve at drumming while allowing them to remain a little crazy and active like kids can be. This ability helps keep the lessons fun and exciting for our son. We are pleased to see our son's ability improve at a pace that is comfortable for him. The drum class is important to my son, and that is because of Pat's teachings. He is a professional at handling the energy of the kids and direct it in a very positive direction. We are very happy to know that there are people like Pat who inspire kids with his talents and open their minds to music. Thanks to Pat Flaherty." "This studio has provided me with the best over site in percussion ever, even more than the others in band. The studio is professional when needed and goofy when needed. I like the variety of instruments and music that you are allowed to play. I enjoy my time at lessons. It has given me a better understanding of music than the modern people will ever guess. Lessons have made me far better at school. It has helped me advance to where it blows me away how far I've gone. Pat Flaherty helps give you the tools to figure out every single piece of music." "I can't recommend Pat highly enough for drum lessons and percussion lessons. My daughter has learned so much from him and she really enjoys her lessons. Pat is really connected to the percussion world all over the country. He's not only a great teacher and mentor, he's a tremendous resource. And he is very dedicated to his students and to helping them achieve the goals they want to achieve. We are moving from Idaho and one of the things we will miss most is lessons with Pat!" "I had finished my undergraduate degree in Percussion at Boise State University and was attempting to find a Master's percussion program at other potential schools with very little luck. I contacted Pat after we had performed a Thanksgiving concert together for the Boise community. Except for one other individual, Pat was the reason I received a Graduate Teaching Fellowship in Percussion and am now attending Central Michigan University for my Master's degree. Pat met with me at the drop of a hat multiple times and aided in choosing my audition music for multiple school auditions. Most importantly, he was able to connect with people he has networked with over his career and allowed me to expedite the process of being accepted into gradate school. Though I was never a student of Pat's, what floored me was how involved Pat was willing to be in my journey to the next step of my life, DESPITE not having any prior experiences with me. Without his guidance and persistence to help in all aspects of the graduate procedures, I would not be continuing my education as I am now. Thank You Pat!" "Being a non-traditional student, I have thoroughly enjoyed my timpani lessons with Pat. While having an extensive background in music and keyboard instruments, he has focused my lessons on exactly what I needed to do to be the timpanist for the Caldwell Centennial Band. He has been able to accommodate both my work schedule, and my specific lesson needs. I am so excited to be learning this new instrument from such an awesome teacher. Thank you, Pat!" "Looking back when I started I realized how much I've improved. Pat Flaherty is an amazing teacher. He has taught me so much. I am now even better than all of my percussionist friends thanks to him. I have improved So Much!" "Pat is the best drumming teacher I have ever met. I've learned so much from him and have been able to apply what I've learned into my everyday drumming. He's one of the nicest guys you'll ever meet and one of the greatest drummers you will ever meet. Taking lessons from him was one of the greatest things I've ever done." "Eli has been taking lessons for several years with Pat. He has progressed very well in that time. I have gained a great appreciation for understanding rhythm and being able to use all your limbs to play drums! Eli is always tapping out a rhythm while he is thinking etc. It's fun to see your child gain an understanding of music. Thanks Pat!" "Pat's studio is a great place that helps me concentrate on the little details to help me improve. Pat is very friendly and welcoming to any and all new students. I've learned a lot in the time I've studied with Pat on stick control, how to practice, moving around drum set and how to work with other musicians. I'm definitely glad that I decided to take lessons from Pat." "I've been playing drums for years and was completely self taught. I realized I needed some direction to improve and grow. I have made more progress with Pat in a few weeks than I ever made on my own. The atmosphere is relaxed and fun but productive. I am so glad I made the decision to take my playing to the next level with Pat's support and instruction." "I like playing the drums because my brother was playing the drums. First I thought "who cares" but when he got a drum set I really wanted to learn how to play them." "These lessons have helped to prepare me for the higher level of band at the high school. Mr. Flaherty has also helped me to think about what I want to do with music in my future. I always want to prepare for each weekly lesson." "Pat makes me laugh. I love what he teaches me. I love when he teaches me something new. I love the drum set beats and the Rudiments. Pat is the Best Music Teacher Ever!" "I improved from second grade in drum lessons. It has impacted school subjects by making me smarter. I have experienced how to use a marimba and a drum set. He can prepare you for a concert or an audition. I like his studio because he has a lot of percussion instruments. I enjoy making music more because music can make you smarter and famous. My lessons have improved my school musical group activities by making me stay on track and work as a team. Pat is also teaching me to play more than one instrument like last year when I played "Santa's Sleigh Ride." He keeps you on track and you learn a lot." "My daughter wanted to play drums rock band style. I was very happy to learn that not only does Pat teach drum set but ALL percussion instruments. I have loved seeing her music expand. My daughter did not enjoy her piano lessons, but with Pat's encouragement she now practices on her own. She had no interest in her elementary school choir but when Pat pointed out it would help her learn timpani, she signed up. He has been an amazing influence and an awesome teacher." "I like drum class for a couple reasons. I like the fact that Pat teaches different percussion instruments and its just fun to play on the instruments." "Pat is an amazing teacher. All three of my kids are taking lessons and they are better after every lesson. He knows how to deal with difficult children in a way that is inspiring. He is always willing to help my son if he has an upcoming band performance as well." "I have noticed that with drum lessons my experiences in band have increased greatly. When I started drum lessons I was behind in band but thanks to lessons I'm above what's required for my current level of band. I'm able to enjoy playing music much more now that I have a better grasp and playing instruments and pieces of music. I also like that I'm able to come to lessons and learn certain requirements and skills I would've never learned in school that would prepare me for furthering my musical experience." "Mr. Flaherty has an amazing wealth of knowledge and experience when it comes to percussion. In only a few lessons I've learned so much more about the art. He pushes me to be a better player. Also, the environment created in his studio is very welcoming and encouraging!" "My nine year old son and I have been taking drum lessons from Pat for nearly two years and we love it. Coming to the studio is something we really look forward to every week. Pat is very skilled at tailoring the learning experience to fit each individual student. So, it doesn't matter what your age, musical experience, or learning style may be. As long as you practice consistently and you're passionate about playing drums, you'll make great progress and have a lot of fun along the way." "I like drums with Pat Flaherty because you get to do even more than just drums, you get to do Percussion." "While I have been taking lessons with Pat I have learned so much about percussion and I now feel a lot more like a drummer. I like how Pat prepares me for my future as a percussionist and I also feel as if I enjoy playing and practicing drums as a result of my time spent taking lessons with Pat." 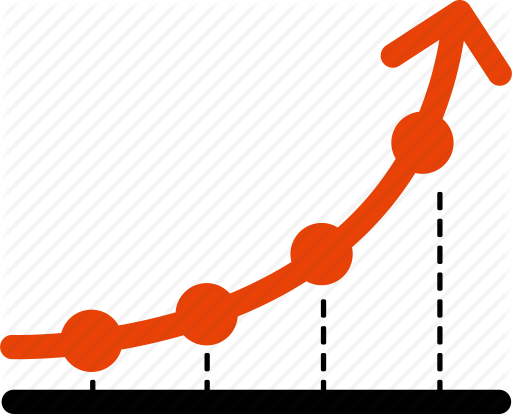 "I have improved greatly from when I first started. This has improved not only in my percussion skills, but it also has helped me in my trumpet playing. It has helped me dramatically in counting and keeping a steady beat." "My son has gained a much greater love for all things musically from his experience with Pat. The instruction he has received in percussion has helped him with his trumpet playing, music reading and rhythm. He is loving learning percussion. Pat is patient, positive and encouraging. My son has learned to set goals and work toward achieving them." "My son has been taking lessons from Pat for the past 9 months and he's learned more in those 9 months than his previous 2 1/2 years. Pat's instructional format allows kids to excel at their own pace and his passion for Art of Drumming is evident in his teaching style and the INCREDIBLE Studio in which his students learn. He also keeps us informed about performance and workshops around town. If there was a "BEST IN BOISE" for drum instructors, Pat would win unanimously. Highly Recommended!" "I like how many instruments Pat has. His teaching has helped me with so many school activities." "My son has shown major improvement in just a few months with Pat. Pat shows great patience and understanding in how to explain concepts and skills. I have been impressed by the depths of Pat's knowledge of numerous aspects of percussion instruments and styles. I appreciate his passion to share his abilities with young people. My son in gaining a great perspective and a better understanding of what it means to be a percussionist." "The amount of knowledge Pat has on percussion is amazing. Pat definitely cares about the students' best interests." "I am a student starting in 7th grade I was the worst percussionist and now I am the best in a lot of areas because of these extra lessons. Because of these lessons I want to drum when I grow up. I also enjoy practicing now and can work well with a lot of things now. I really recommend taking lessons from Pat." "We got lucky finding Pat. We were new in town and it just so happens a salesman at Fred Mayer who happened to be Pat's former student recommended him. Plus, my sons high school music director also recommended Pat. It was a win-win! I've watched my son's skill improve 110 percent over the past 6 months. I don't think I could find a more talented instructor for my son." "Mr. Flaherty is a perfectionist and it shows! He expects the best of his students and is highly complimentary when tasks are accomplished. My son enjoys his lesson time and looks forward to showing off his improved technique each week. Pat is a very effective teacher." "Lessons with Pat have really helped with my reading and getting faster and the correct pattern sticking. He has helped me understand music when I first start a new piece and he believes in me. And I need that." "I think taking drum lessons has really improved my concentration and focus. I like it and I bet you would too. I wouldn't have ended up like this unless I did work each day." "I really enjoy Pat's lessons. I have learned things I never imagined I would learn. I have learned it faster that I thought I would as well. He also does not put pressure on me." "My daughter has blossomed into a great little drummer at Pat Flaherty's Studio! His teaching style is fun and approachable. He teaches one step at a time, always checking for understanding before he moves on. He also educates us on various learning opportunities and events in the community. These events can inspire or teach your student to reach their maximum potential. I highly recommend Pat's Studio." "Since I have started taking lessons from Pat he has been able to take my current knowledge and focus it into a productive and fun experience to expand my playing ability. His ability to teach all age groups and abilities help his students progress faster. Concepts are explained very well with written, video and practical exercises. He has everything you could need to get started playing percussion. His fees are very reasonable and he has been able to work with my odd work schedule." "I bring all three of my children to Pat for drum lessons. My oldest has been coming for 6 years and my other two for 4 years. They have learned so much about music and the discipline that it takes to become a better player. They have learned not only how to play drums but also bells and marimba. It has helped my oldest for his school band and will help the other two when they join the school band." "Anyone who may be interested in learning how to properly become a traditional drummer must consider Pat Flaherty's Drum and Percussion Lessons. He is very directed and structured in his approach to teaching anyone how to be a drummer. He is patient and understanding and very easy to work with. He also has a great sense of humor." "Pat has helped me learn more about the drums than I thought that I would ever learn. He's the best music instructor/teacher that I've ever met and am I glad that I'm in his class." 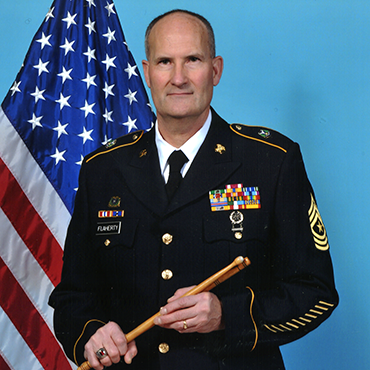 "Pat is very professional and has more than 30 years of experience teaching percussion! We came to Pat so our son could improve his skills and in a month we has seen our son's abilities blossom. Pat is positive, knowledgeable and a patient instructor. He truly cares about his students and has a passion for teaching music to the next generation." Pat began working with the Kuna High School percussion section on an occasional basis, in a workshop-type setting. Through these clinics our students began to improve quickly, once they put in their full efforts. It's now a great pleasure to work with Pat on a full-time basis! Pat helps us with everything: marching percussion/drumline, concert percussion, solo and ensemble and music fundamentals. I especially appreciate his professionalism and his ability to connect with students. Pat is a very wise percussionist and has taught me a lot of things about percussion from great warmups to the little things with technique. I have only been in lessons for a few weeks and I have already improved in playing percussion. Mr. Flaherty is a great teacher with lots of experience both teaching and performing. I have learned a lot about Percussion from Pat by using his pattern pages and through practices that he helped with. I am very grateful for all the work Pat has helped with not only for me but all the Kuna Percussionists. I thank Pat for teaching me the basics of percussion. I didn't know how to do most basic beats and rudiments. I was able to learn snare thanks to him. He always gives out great tips. He taught me to listen to the parts that I play and how to relate to the rest of the band music. I took lessons from Pat for many years, and you opened up an entire world as far as what could be done with drumming. I remember when he sent me to a drum camp at the University of North Texas. It was there that I realized I had much to learn! I wouldn't know half of the things I know now if it weren't for that experience. Thank you, Pat! You're a great educator and percussionist! I took lessons with Pat Flaherty from 1980 through 83. After becoming a confident drummer and percussionist with solid basics I studied classical percussion with Tony Cirone and Jack Van Geem of the San Francisco Symphony; John Galm and Terry Smith of the Colorado Symphony; jazz drums with Donald “duck” Baily, Peter Magadinni and Akira Tana. I will say, out of all these amazing teachers and players, pat has had the biggest influence on me. He is truly a great teacher! He is the man! I always loved music and knew that I wanted to be a music teacher someday however passion alone does not always produce desired results. Pat helped focus my music instruction and took my percussion playing to a new level. Pat prepared me for college auditions, sent me to the Troopers Drum and Bugle Corps which I marched for two years. He took me on my first "real" gig to play "The Living Christmas Tree" at College Church of the Nazarene! I am forever indebted to Pat for his mentoring through the years and now I "live my dream composing and teaching music." Thanks Pat! I took my first 'real' drum lesson with Pat when I was 15 years old and when I walked into his little studio on 5 Mile filled with all the different varieties of percussion instruments - marimbas, timpani, drum-sets, etc. - I knew I was in the right place. The instruction and exposure I gained while working with Pat really opened up my eyes to the overall scope of percussion (and music in general) and for that I am eternally grateful. Thank you Pat and may you continue to inspire future generations! My lessons with Pat Flaherty from 92-98 as a junior high and high school student set me on a path as a well-rounded working drummer and percussionist in my adult years. I am thankful for the time that was spent on fundamentals and reading music. Some instructors can make you sound like a "good" player by teaching by rote or only focusing on a few aspects, but knowing the "hows and whys" of your hands/feet/brain with many styles and instruments has become something I have stressed to my current and past students. A lesson with Pat isn't just instruction on the craft, you can expect to learn leadership skills, common-sense, values, and establish a great work ethic. Thanks Pat!